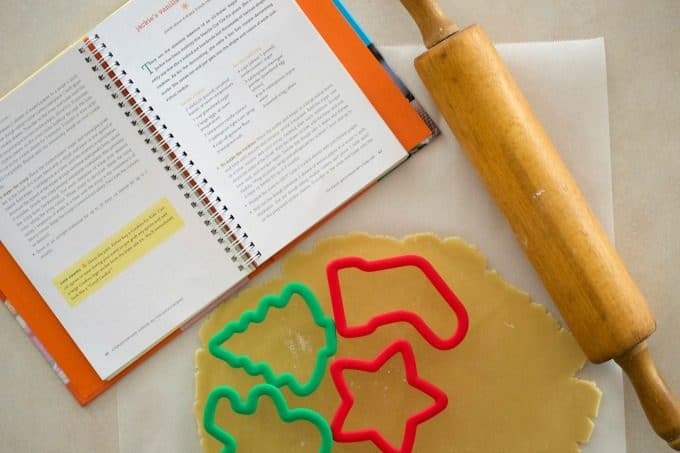 Jackie’s Vanilla Cut-Out Sugar Cookies – a simple, yet very tasty cut-out sugar cookie from the Cookies for Kids’ Cancer Cookbook by Gretchen Holt-Witt. This sugar cookie will not only bring a mile to those who eat it, but will also provide funding for kids’ cancer research. You can also help with De’Longhi’s Days of Giving campaign. Read about it below. Welcome to Day 7 of our 12 Days of Cookies. This time of year is the season of giving. And to be honest, I really think it’s more fun to give than to receive. Yes, it’s fun opening presents that people have bought or made specifically for you, but there’s just something about the giving part of the process that makes me feel all warm and fuzzy inside. I’m thinking you might feel the same way, too. For Day 8 in our 12 Days of Cookies series, I’m am proud to be partnering with De’Longhi in their Days of Giving campaign. 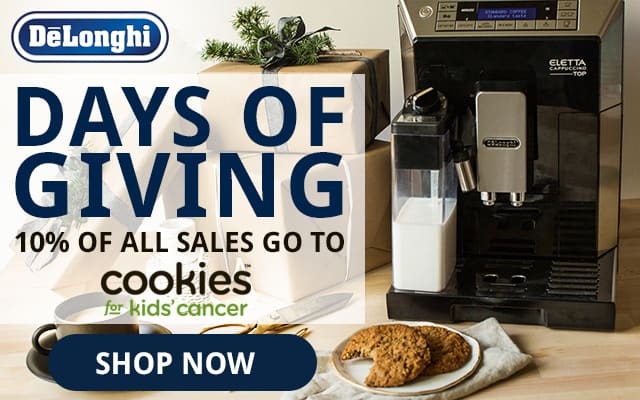 This holiday season, November 29th through December 20th, De’Longhi is donating 10% of its delonghi.us sales site-wide to Cookies for Kids’s Cancer (CFKC). This organization is non-profit and is dedicated to funding research specifically for pediatric cancer which is the #1 disease killer of children in the U.S.
AND…Now through December 20th, you can receive and additional 30% off your purchase site-wide at De’Longhi when you use the code word, “COOKIES“!!! Cookies for Kids’ Cancer was founded by Larry and Gretchen Holt-Witt in 2007 when their son Liam was diagnosed with childhood cancer. They were shocked to learn of the lack of effective treatments for pediatric cancers due to lack of funding. They pledged to support the funding of research for safer, more effective treatments for children battling cancer and to provide a way for people of any age, anywhere to become easily involved. You can be a “Good Cookie” by donating and learning more about this important cause by visiting www.delonghi.us to purchase products and www.cookiesforkidscancer.org to learn more about CFKC. I’ve just purchased one of De’Longhi’s Combination Drip Coffee and Espresso Machines for my husband. For today’s post, I was provided with De’Longhi’s Livenza Convection Oven so that I could bake my cookies. I was pretty impressed with this baby. It comes with a bake pan, a pizza pan and two racks. I was impressed with how quickly Jackie’s Vanilla Cut-Out Sugar Cookies baked. I used the two racks because I had so many, but this oven is great when you only want to make a few cookies and don’t want to turn your big oven on. Kurt was super excited about the Pizza function. I can tell we’re going to be using this A LOT! And now I won’t have to fight with my toaster to get my bagel out. This oven will make an ideal holiday gift for those who are living alone, couples and just any home cook who can never find enough space in their oven. 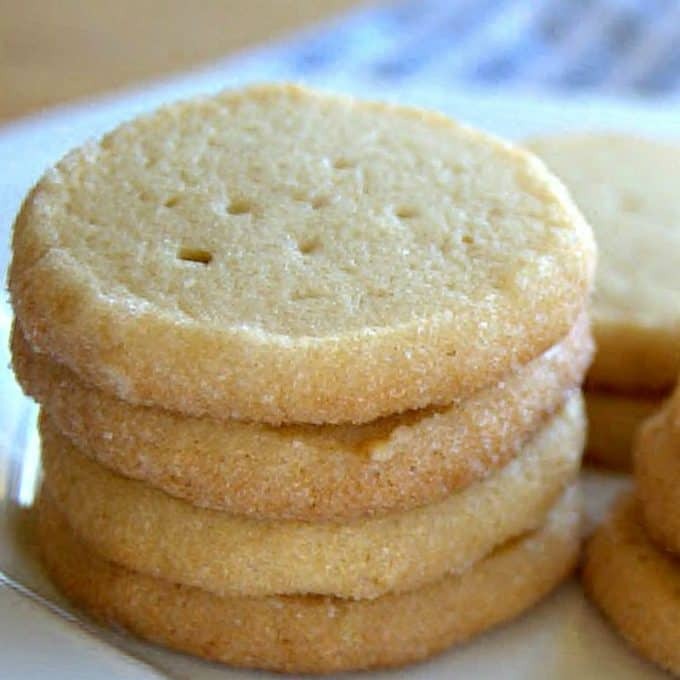 I found Jackie’s Vanilla Cut-Out Sugar Cookies in Gretchen Holt-Witt’s, ‘All the Good Cookies Cookbook‘, p. 43. You can WIN your very own copy below. 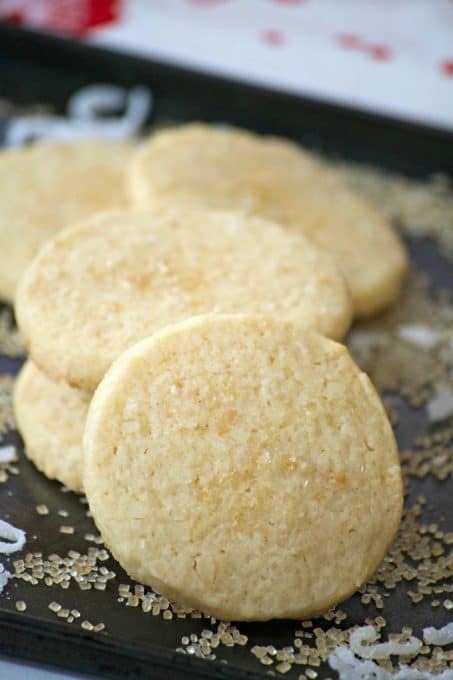 Jackie's Vanilla Cut-Out Sugar Cookies are tasty sugar cookies from the Cookies for Kids' Cancer Cookbook and I baked them in my De'Longhi Livenza Oven. Cream the butter and sugar in a large mixing bowl until light and creamy, about 3 minutes. Add the eggs, one at a time, vanilla and corn syrup, beating after each addition. Scrape down the sides and bottom of the bowl. With the mixer on low, add the flour and the salt. Beat well, scraping down the sides and bottom of the bowl as necessary. Divide the dough into 3 disks, wrap in plastic and slightly flatten. Refrigerate for at least an hour, up to 2 days or can be frozen for up to 2 months. 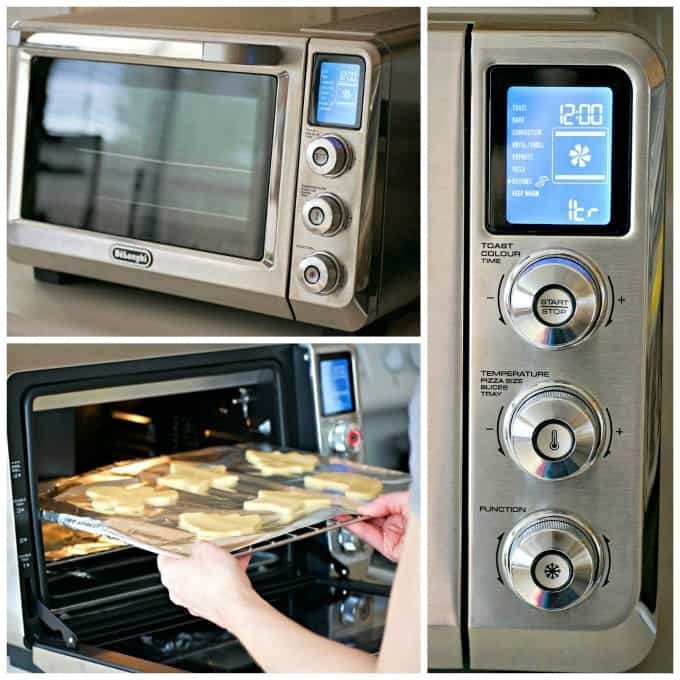 When ready to bake, preheat your DeLonghi Electric Oven, placing it on the cookie setting, 2 racks, for 10 minutes. Place the cookies on the two oven racks covered in aluminum foil, and put in to the oven at position 2. Bake the cookies for 5 minutes, switch the tray positions and bake until the edges begin to brown, about an additional 5 minutes. Repeat with remaining cookie dough. Cool on sheet for 3 minutes and transfer to wire rack to cool completely. Repeat with remaining dough. Place the confectioners' sugar and meringue powder in the bowl of an electric mixer fitted with a whisk and beat on low speed to blend. Add water, 1 tablespoon at a time, until the mixture is spreadable. Increase the speed of the mixer to high and beat until peaks form, about 6 minutes. Divide the icing among resealable containers (this prevents the icing from hardening). Tint each container of icing your desired color using the icing colors. When ready to decorate, dilute the icing using 1 teaspoon of water at a time until the icing is the consistency of heavy cream. 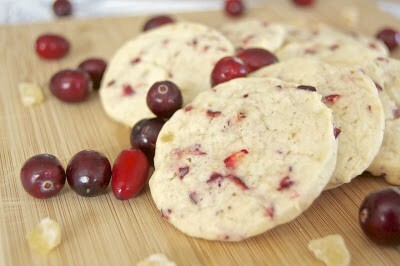 Keep the icings covered if not using and decorate the cookies as desired. Store in an airtight container for up to 10 days, or freeze for up to 3 months. Preheat the oven to 350 degrees F. Line 2 cookie sheets with parchment. Roll out the dough between 2 sheets of waxed paper to a scant 1/4-inch thickness. 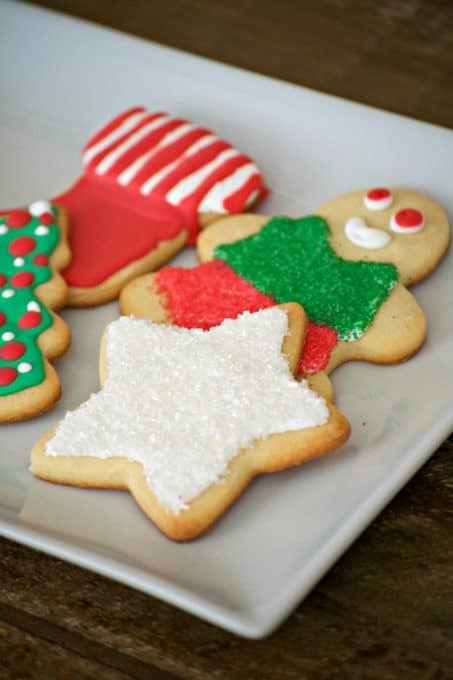 Cut out dough using cookie cutters and place 1 inch apart on prepared cookie sheets. Place in oven and bake until cookies just begin to brown on edges, about 8 - 10 minutes, rotating cookie sheets halfway through baking time. Cool on sheet for 3 minutes and transfer to wire rack to cool completely. Repeat with remaining dough. 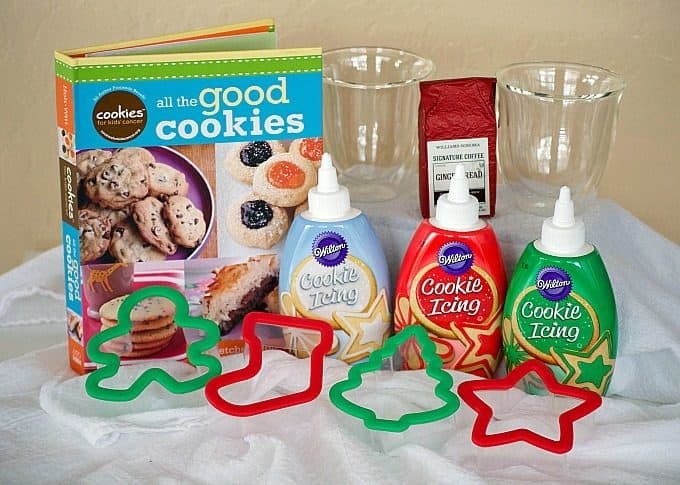 I was also provided with a wonderful box of items to help with the making of these cookies and you can win your very own holiday cookie decorating gift basket! 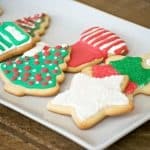 Take a look at these videos for some great cookie ideas for Christmas! **This post contains an affiliate link(s). These are links that can take you to a product (or products) that I recommend. I do receive a portion of the sales or credit for my future purchases from any items purchased through those links. Your purchases encourage my baking, cooking and butter habit, and contribute to the life of this blog. I thank you so very much for your support. Let’s keep having fun in the kitchen!! This is a sponsored conversation written by me on behalf of De’Longhi and Braun. The opinions and text are all mine. 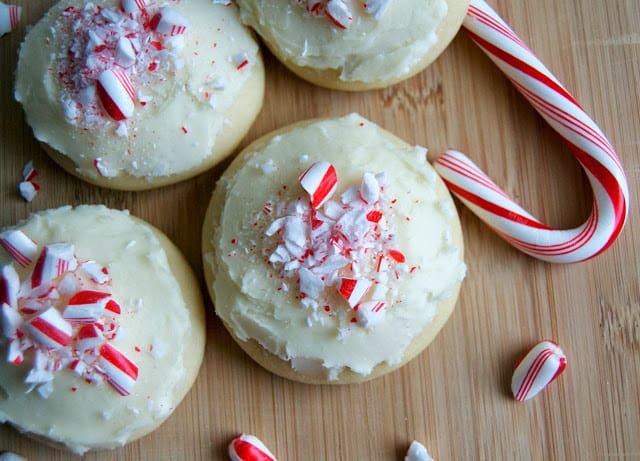 What fun little Christmas Cookies! Gotta make some with my boys this week! 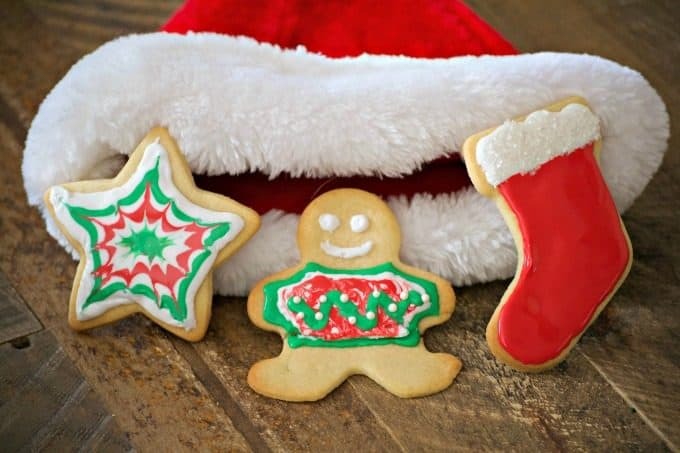 Have a wonderful time making cookies and a very Merry Christmas! I’m in cookie heaven here. So many great options, recipes, so pretty! I love the holidays, and Christmas cookies! Me, too, Sandy. Cookies are my favorite! I hope you and yours have a very Merry Christmas! I’ll be happy to share, Jennifer! I love their cause, too, such a great thing they’re doing! These are so fun and cute!